"Culture and Existence of the Northwest Coastal Indians: Art, Spirituality and a World Entwined"
Living in a rented room in Toronto, I "emerged" one summer to make a spiritual journey to the west coast of Canada. There, I sensed from afar, was an answer that I must seek -- by going there, I thought, and waiting on the adopted island of a friend until that answer came to me. I felt, emanating from this wild land -- and from deep within my soul -- the presence of the knowledge of Maharishi Mahesh Yogi, which was making its way up the west coast of North America from California, where it had first been introduced on that continent. I made this journey to Vancouver -- by hitchhiking, by train, and even once starting out on a "moped" -- three times before completing that rendezvous with fullness of life which I sought. The Northwest Coastal Indians lived in a seclusion of sea, mountain range and small islands, along a 1500-mile long band of shore lands and mountainside that extends from Alaska to Oregon. This isolation helped form the unique art of the area -- while the rivers of the south allowed the tribes access to the interior for trade, migration and cultural exchange. These people co-existed with their environment for over 10,000 years. There they found bounteous food in the form of fish and of animals for hunting, though they did not farm much. They made clothes and blankets from shredded bark wood, built large multi-family dwellings using plank wood, and even built fishing corals across rivers to capture the salmon. The "world view" of Native Americans was a simple one. It was a view of the World that they knew, which they contacted daily in their survival, and which they grew to honor and even to worship. 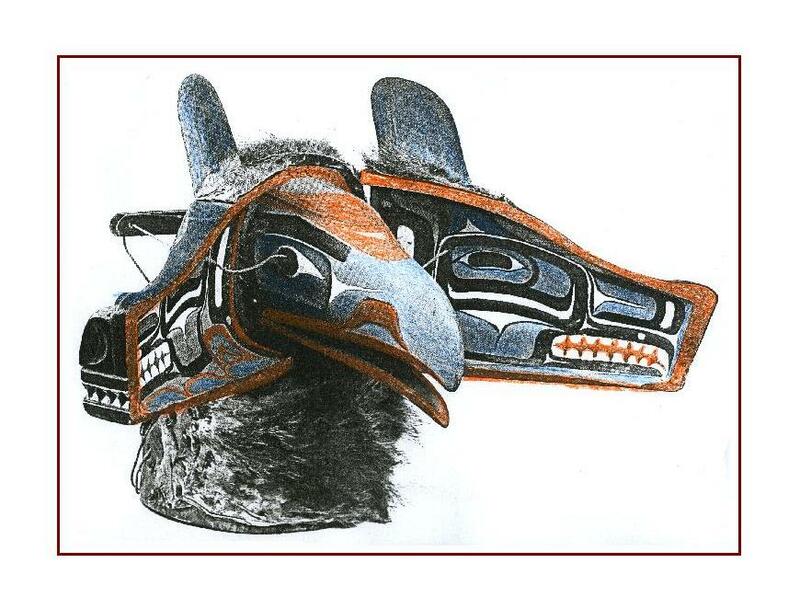 In the Northwest this world view and the art that emerged from it included all the animals of the natural realm -- the eagle, the raven, the wolf, the killer whale. Also, there was the mountain goat, the salmon, the clam and even "unseen" animals such as the sea monster. These animals were displayed in formline art through weaving and carving on dresses and clothing, and on family or tribal homes and buildings. 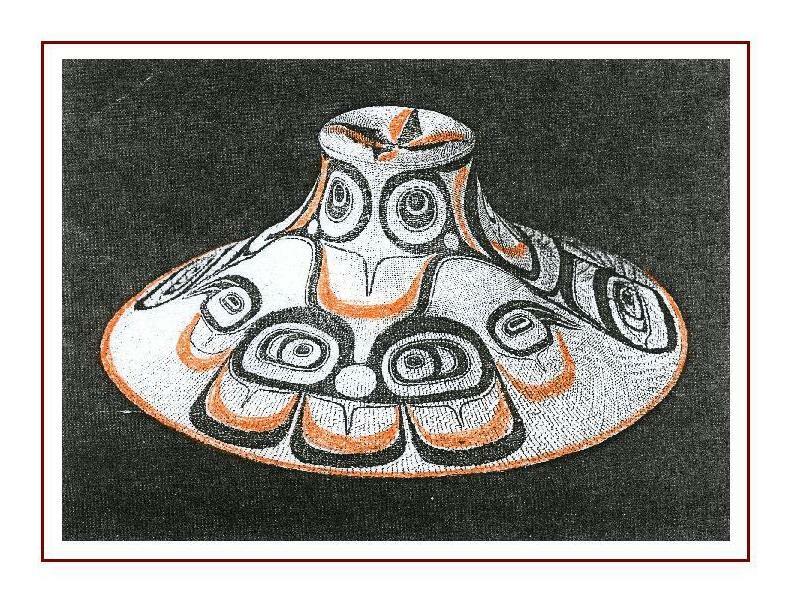 They also were mixed with representations of Shamans, or spiritual leaders, in the crest or totem pole. 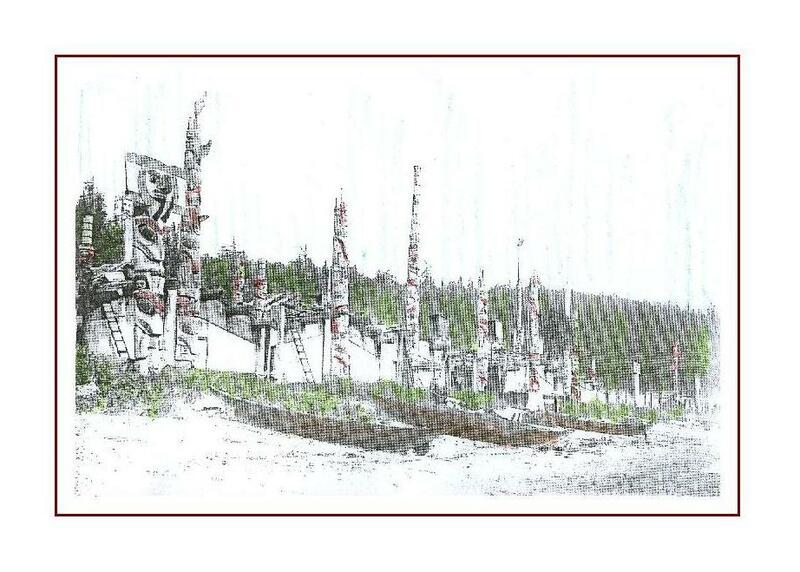 These tall carvings, created from felled trees, were erected in front of their multi-family shelters called “plank homes”, created from whole and split logs of red and yellow cedar. The crest pole would tell the story in carved and painted images of the important families within. Archeologists have discovered over 5,000 years of artistic creations of the Northeast Coast native people. From 3,500 to 1500 BC, they used antlers, stone and bone carvings - most often on hand tools - to depict the activities, and the animals and environment of their daily lives. Many primitive carvings of the human figure have also been discovered. 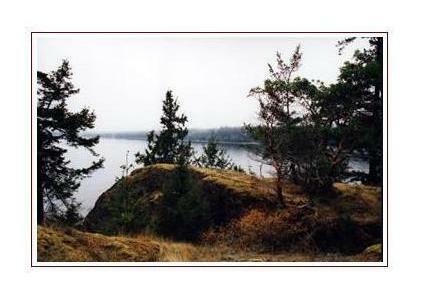 The spiritual beliefs of the Northwest Coastal people were also interwoven with their experienced world. Shamans, or spiritual leaders, would perform duties of healing, bestowing of good weather, and finding of animals for hunting. These performances often came with ornate dress and rituals. 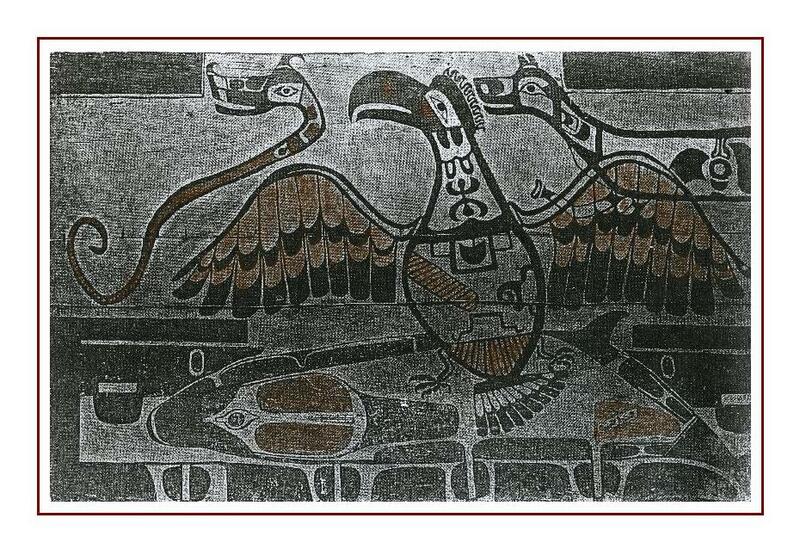 The Haida people tell the story of a mischievous Raven who uses his beak to pry open a clam shell. Within, he finds the first people of the world, whom he coaxes to come out. They emerge into a world of everyday life, filled with adventure, risk, love and spiritual quest. This reflects the Northwest Pacific Indian world view of a challenging existence juxtaposed with the unexpected fortune of inner transformation. As did these first people, we, too, have discovered both a prodding guide and a spiritual master in Maharishi, who would not be satisfied until we had emerged into our new world, filled with spiritual "creatures" delving deep into ancient wisdom, while flying high to meet the angels ... and to proclaim the dawn of peace in their dear home, “Mother Earth”. 1. Vedic understanding tells us that a people or a civilization are cultured by their natural environment: their climate and geography actually form the basis of their language, their traditions and their art. For instance, the names of the Northwest Coastal Indians seem as primal as the land and animals from which they drew their sustenance: Tlingit, Haida, Oowekeeeno, Chinookans and Tillamook. We structure our world as we see it, and according to our state of inner consciousness. 2. The Northwest Coastal Indian people lived a challenging life, yet they drew strength and inspiration from their spiritual practices and art. Maharishi has shown us how to regain strength, confidence and happiness by experiencing inner Being -- the ultimate source of all religions and cultural values -- within, through Transcendental Meditation. 3. Primal cultures express themselves eloquently in their artwork, just as do cultures from more "elaborate" lineage. Maharishi has undertaken to fortify the native peoples of the world (see: Native Culture) through honoring and sustaining of their languages, cultures and art. In this practice, we will encourage a world of rich diversity in a time of growing unity.